Special thanks to Warner Brothers for providing access to cast members Zane Austin and Francesca Capaldi and providing a digital screener for review. This post contains links to Amazon. If you click on the link and make a purchase, I get a tiny commission of the sale. While the first Max movie is a bit of a more serious movie focusing on a war hero dog, the second movie, Max 2, is a lighthearted family film. Max has a new assignment..he's to serve on the detail of the President of the United States! But he quickly forms a bond with the President's son, TJ, which calls his ability to serve in a serious capacity into question. TJ is struggling with his new role as the President's son, though, and loves Max. Their quick bond eases some of his discomfort at constantly being in the public eye. The Russian president is arriving to hammer out some details with the President of the United States and brings along his daughter Alex. Alex and TJ become quick friends with a flare of attraction between them. Their banter is delightful and cute and they become a root worthy pair. Someone is out to sabotage negotiations, though, and TJ, Alex, and Max assign themselves to the case. Their clever thinking and ideas give them the chance to investigate many of the people on the grounds while they also have some adventures of their own....all with Max by their side. As noted, this is a family film and one you can watch comfortably with the kids. It's super charming--the casting of both Zane Austin and Francesca Capaldi is perfect. They are cute and bring a lot of energy and personality to their roles. And dog lovers get the added bonus of having Max in many scenes but never in true peril. This is not a sob your eyes out dog movie, fortunately. There are a lot of adventures and I was genuinely surprised by the conclusion of the film! 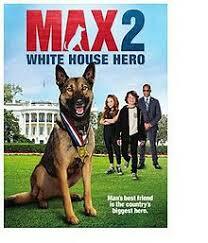 Now available on digital HD and available on blu-ray May 23, Max 2: White House Hero is recommended for families and kids. The Blu-Ray edition will include 15 minutes of extras in addition to the film, including blooper scenes with the canines! Tomorrow I'm excited to share some insights into the making of the movie from Zane Austin and Francesca Capaldi. I really enjoyed the conference call with them so much.